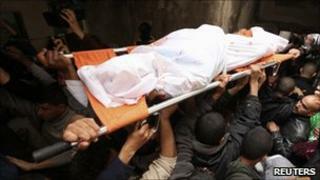 The bodies of two Palestinian men have been found near the Gaza-Israel border, Palestinian medics report. The Israeli military has confirmed firing on Saturday on two men who approached the Israeli-enforced no-go zone near the border. On Saturday, Palestinian militants fired dozens of mortars into southern Israel in what appears to be their heaviest such barrage in two years. About 50 mortars were fired, injuring two Israelis. Israeli tanks later shelled targets in the coastal strip, wounding at least five people, Palestinian officials said on Saturday. The BBC's Jon Donnison in Gaza says this seems to be an escalation - both in terms of the number of mortars fired from Gaza and the fact that Hamas said it was responsible. Hamas's military wing said it launched dozens of the mortars, our correspondent reports. Although members of Hamas's military wing rarely carry out attacks, the Israeli military says it holds the group responsible for all militant activity in the Gaza Strip. Israel maintains a buffer zone along the border fence, where Gaza militants have planted bombs and explosives targeting Israeli troops in the past. Israel often opens fire on people who it says go too close to the fence to stop attacks by militants. Dozens of people have been killed in this way, many civilians.